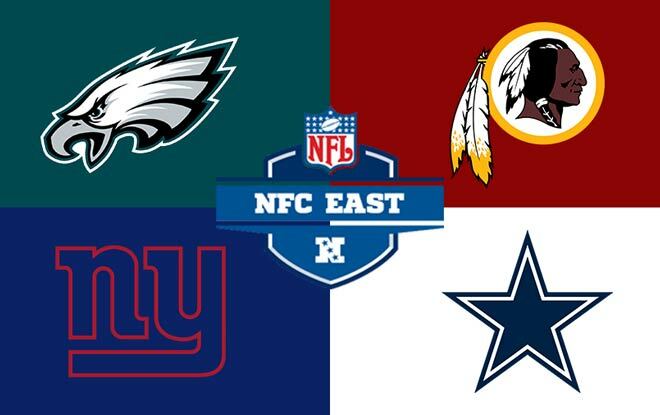 The best betting sites pick the best team to win the NFC East division. As the current reigning and defending Super Bowl champions, the Eagles are on paper the top team in the NFL. And by the same logic as NFC East champions, Philadelphia is the best team in their division. Historically, however, the Dallas Cowboys have been the most dominant, with 22 divisional titles. Including two of the last four. The Washington Redskins won their most recent division championship in 2015. And the New York Giants have not topped the NFC East since 2011, when they also won the Super Bowl. You know you’re well ahead of the competition when the Super Bowl MVP is your backup QB. Well, Nick Foles is theoretically Carson Wentz’s backup. However, Wentz is recovering from a torn ACL and has not been cleared for contact. Wentz didn’t play in the Super Bowl but is still the Eagles’ cornerstone. Conversely, a few players who did play that fateful night have departed the team. Such as cornerback Patrick Robinson, tight end Trey Burton, wide receiver Torrey Smith and running back LeGarrette Blount. To make up for those losses, Philly has brought in defensive end Michael Bennett, defensive tackle Haloti Ngata and wide receiver Mike Wallace. Barring any unforeseen event, running back Ezekiel Elliott will start and play all 16 regular season games. And the timing could not be better for the Cowboys, as that fact alone improves their odds at the best betting sites. The passing game will have to make a few adjustments. What with the release of wide receiver Dez Bryant and the retirement of tight end Jason Witten. The two were long standing staples in Dallas. Then again, starting QB Dak Prescott only played with them for two seasons. So it’s not like they’re the Scarecrow to his Dorothy. Moreover, Dak will have Cole Beasley, Tavon Austin, and Michael Gallup in his receiving unit. All things considered, though, it’s very likely Zeke will have the ball in his hands as much as Prescott, if not more. Which is just as well, since Elliott will be playing with a chip on his shoulder. Former head coach Ben McAdoo pulled a big McAdon’t last season. And general manager Jerry Reese let him. As a result, both became personae non grata among the Giants throngs. New GM Dave Gettleman and new head coach Pat Shurmur then came to redesign, rebuild, and reclaim (shoutout to Seth Rollins). They obviously retained once and future starting QB Eli Manning and his preferred target Odell Beckham, Jr. But they also added tackle Nate Solder, as well rookie running back Saquon Barkley and rookie guard Will Hernandez. Manning had one of his worst seasons in 2017. However, maybe he played badly on purpose. That way McAdoo would bench him, which was the coach’s downfall. It cost Brother Eli his starting streak, but it was a genius plan and well worth it. The Skins missed the postseason for the second straight year in 2017. So in a way they decided to sacrifice the future for the present. The allowed Kirk Cousins slip away and brought in Alex Smith. The former Chiefs QB is no spring chicken, but has a proven track record and can lead a team to the playoffs. Odds taken from BetAnySports.eu, one of the best betting sites (now with mobile betting).